Limited edition of 10.000 copies; each unique copy is bound with one of a selection of recent print fabrics from the Pucci collection. 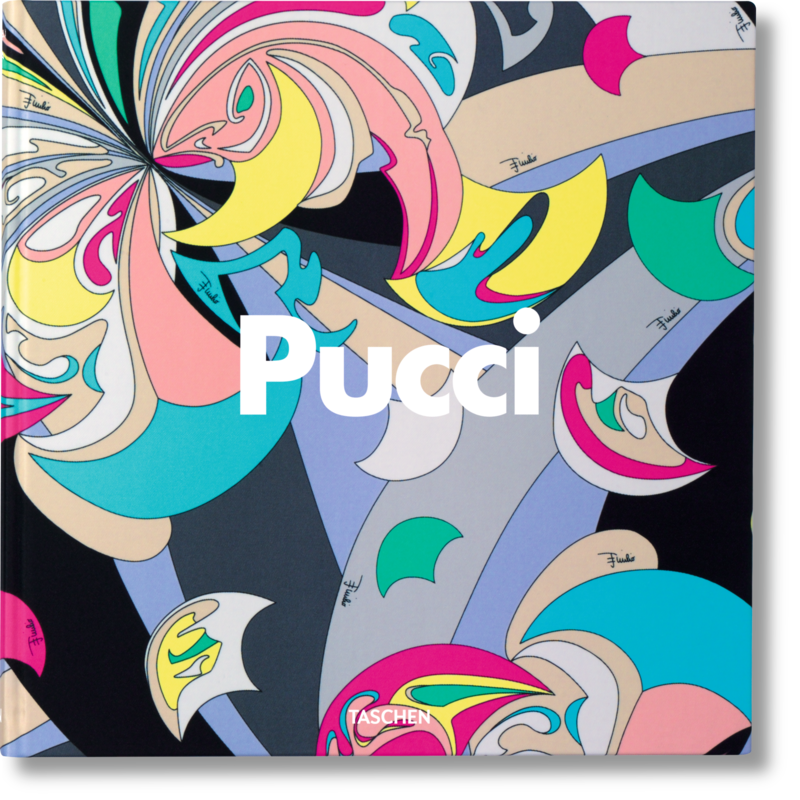 Emilio Pucci (1914-1992) had a passion for women, a visionary sense of style, and an eye for color and design. With these talents he created a fashion house unlike any other. 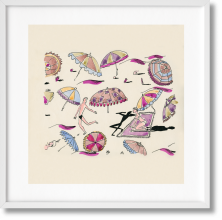 By the early ’50s his boutique on the isle of Capri was catering to wealthy sophisticates, heiresses and movie stars buying his "Capri pants", silk scarves and lightweight separates. By the end of the decade, Jacqueline Kennedy and Marilyn Monroe were wearing his dresses, and by the mid-60s the label was synonymous with the gilded lifestyle of an international jetset. Today, the house remains as vibrant as ever–Victoria Beckham, Elizabeth Hurley, and Kylie Minogue are adherents–and recently celebrated its 60th anniversary. 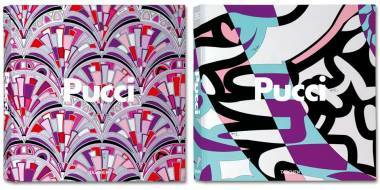 The Pucci story is a modern epic with its roots in renaissance Italy: the brand’s founder, the Marchese Emilio Pucci di Barsento, was a charismatic aristocrat whose lineage extends back to the 14th century. It is a story of evolution: how a family company grew from one tiny store to an international brand with 50 boutiques worldwide (and a presence in 300 more). 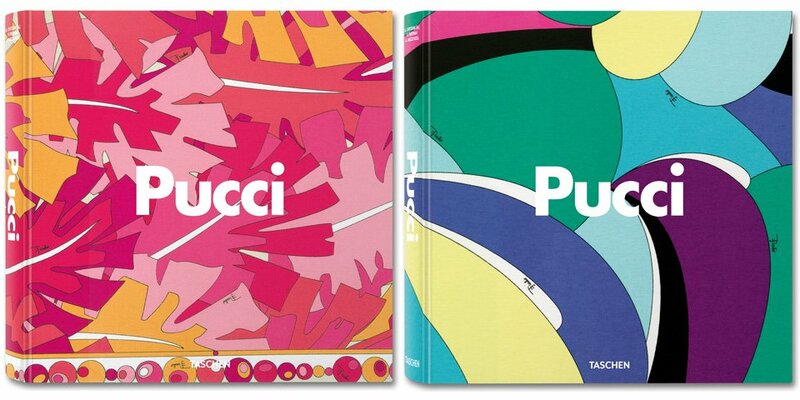 And finally, it is a tale of innovation: Pucci was one of the first brands to bear a logo, and a pioneer of diversification into interiors, athletic wear and accessories. It introduced free-moving, lightweight fabrics, pop art prints, and a new color palette into womenswear, and constantly pushed fabric and printing technologies. Featuring hundreds of photographs, drawings, and candid shots from the archive of the Emilio Pucci Foundation, this XL tome captures the breathtaking elegance and drama of a unique brand. 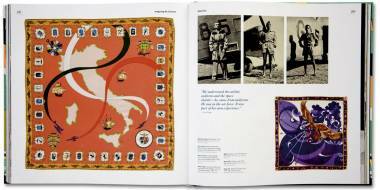 Vanessa Friedman’s text places Emilio’s achievements in the context of fashion history, and provides insight into the remarkable Pucci dynasty. Vanessa Friedman is fashion editor of the Financial Times, where she writes a weekly style column and the blog Material World. Previously, she was the features director of UK In Style, and contributed regularly to The Economist, The New Yorker, Vogue, and Entertainment Weekly. She is the winner of the Newswomen's Club of New York Front Page award for specialty writing, and is on the advisory council of Princeton University's History Department. 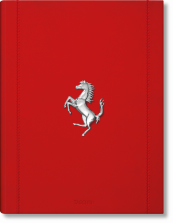 Alessandra Arezzi Boza is a Costume and Fashion historian, has worked as a consultant for the Costume Gallery at Palazzo Pitti in Florence and in several projects for fashion houses and their archives. Since 2001 she is the curator of the Emilio Pucci Foundation. Armando Chitolina worked as a design consultant and art director at Vogue Italia and L'Uomo Vogue, and image consultant for fashion houses Moschino and Mila Schön. His TASCHEN titles include William Claxton's Jazz Seen, Gian Paolo Barbieri's Equator, The Book of Tiki, Naked as a Jaybird and Valentino: A Grand Italian Epic. 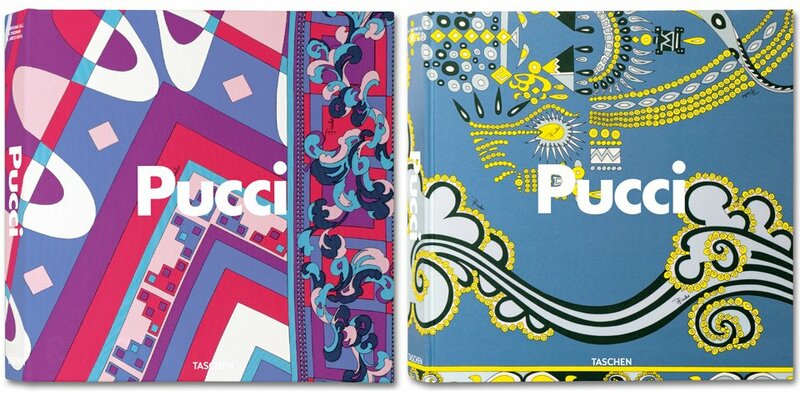 "Emilio Pucci, the out there designer of designers comes in a beautiful designed format. Italian go-go with the brightest colors on this planet. Beautiful, beautiful, and beautiful."